We are delighted to welcome our very own native Californian bhikkhuni, Venerable Suvijjana, back to the Bodhi House in this coming New Year. Ven Suvijjana has been retreating at our Aranya Bodhi Hermitage for the past 6 months. 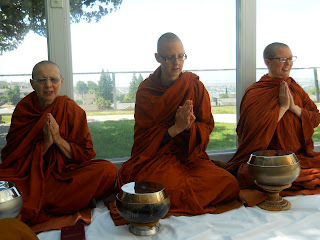 Suvijjana Bhikkhuni plans to participate in Friday evening Kalyanamitta meditation group gatherings, offer sutta study group time, the Bodhi House during this upcoming month of January 2012. Welcome back to Fremont Venerable Suvijjana!